MALOLOS — Eloy Poligrates scored 17 points as Euro-Med used a 28-0 blast to beat Foton, 93-81, and arrest a four-game skid on Sunday in the PCBL Chairman’s Cup at the Malolos Sports and Convention Center. Poligrates, making a return to commercial basketball after a six-month absence, scored eight points in the second period where Euro-Med came up with a 24-0 finish that made it 54-23. Euro-Med scored four straight to open the third quarter for a 35-point lead. Poligrates made his debut with Euro-Med along with fellow ex-pros Lester Alvarez and Eric Salamat, and immediately made their presence felt. Alvarez, who suited up for the Star Hotshots in the PBA, had 10 points in his first game with Euromed, while Salamat had five markers. “Inexpect ko na talaga sa mga bata. Before kasi, walang fire sa mga mata nila pero nung dumating ’yung mga reinforcements namin, parang dun na nag-start ’yung fire nila na ibigay nila ‘yung best nila,” said Euro-Med coach Yong Garcia. Jopher Custodio scored 11 points and had 13 rebounds, while import Ola Adeogun, playing with an injured groin, also had a double-double of 11 points and 11 rebounds for Euro-Med. “Kahapon pa masakit ’yung groin ni Ola pero sinabi niya na maglalaro ako kahit masakit. Ibibigay daw niya quality minutes pero kung hindi siya gamitin, okay lang sa kanya para mas ready siya sa next game,” said Garcia. 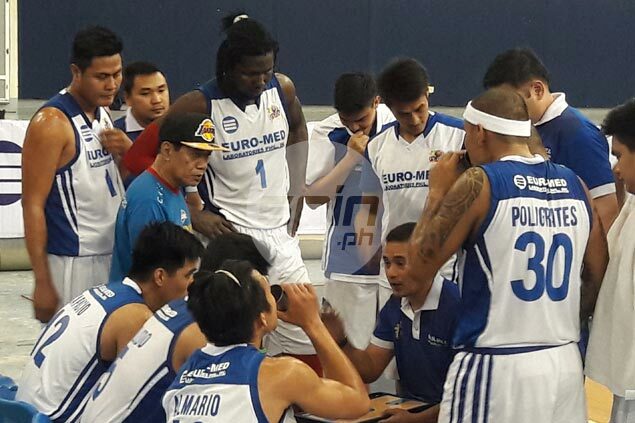 Euro-Med wasted the big lead and was outscored by Foton, 58-39, in the second half. “I always push the players na ibigay nila ’yung best effort nila. Sabi ko sa kanila, hindi makakatulong sa atin ‘yan. Nung last part ng game, nag-relax na sila dahil ayaw nila dumepensa,” Garcia said. Levi Hernandez added 18 points, while Mikee Reyes had 14 points and 10 assists for Foton, which bled for points in the second period, scoring just nine points as it fell to 2-3. Euro-Med 93 — Poligrates 17, Custodio 11, Adeogun 11, Almario 10, Alvarez 10, Capacio 8, Galanza 8, Saitanan 5, Salamat 5, Salcedo 4, Tajonera 3, Gil 1, Vigil 0. Foton 81 — Hernandez 18, Reyes 14, Ablaza 13, Enriquez 13, Ibrahim 11, Gomez 7, Rivera 2, Moraga 2, Nacpil 1. Quarterscores: 23-14; 54-23; 72-52; 93-81.